According to Tony; This library is a collection of buildings used to generate regional scenery for X-Plane using World2XPlane and other projects. The library is opensource and is included/updated in each release of World2XPlane and maybe used freely in any non-commercial scenery. Creating Models for use with World2XPlane. Please follow these basic rules for getting the model to work correctly when used for scenery generation. Make sure the origin of the model (0,0) point is directly in the middle ground of the house, and the model is lined up with the X and Z axis (i.e. It isn’t slanted). This means that in Sketchup, the Y axis should cut straight up through the centre of the house, and the X and Z should be aligned to your outer walls. This is really important to get the model to rotate and fit properly into the footprint and match the scenery correctly. Create a foundation a few metres deep for the building. Expect the house may be placed on the side of the hill or sloped terrain, and with out foundations on the negative Y axis, it will appear to float. 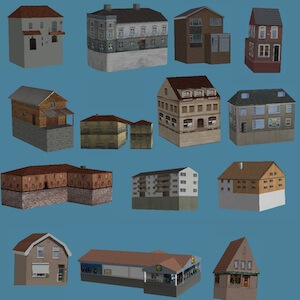 Put as many buildings as you can onto one texture sheet, mix and match styles to create new varieties if possible. The less textures X-Plane needs to load, the better. RES_10.00x15.00x3.00_PL. For a residential building (RES), with a footprint of 10m by 15m, and a height of 3M, with a regional variety of Poland. RET_15.00x20.00x4.00_EU. For a retail building (RET), with a footprint of 15m by 20m, and a height of 4M, with a regional variety of all of the EU. Please only use metric measurements, as this is what X-Plane uses, as well as the importer program. Use as few faces as possible. There is no need to model window ledges, skirting. These things can be done in a texture, and really help with performance. If using models from Google Warehouse and retexturing, be aware, many of the models have hundreds of complicated faces. Keep textures small, you can easily map a house using a small area of one texture sheet. The textures do not need to be high resolution. The importer will use the 3 CSV files, residential.csv, industrial.csv and agriculture.csv. These files also include items from the R2 library.